On Saturday 8th October over 220 members of the Dover Arsenal Supporters Club were in attendance for the 8th Annual Dover Gooners Legends Dinner. As well as those from the surrounding area, guests had travelled from all over England and Italy. 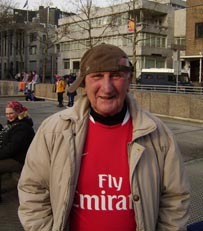 Arsenal Football Club was, as usual, represented by Supporters Club Liaison Officer Jill Smith. This year the planned guest speaker was former Arsenal and England left-back Kenny Sansom. Unfortunately he cancelled at very short notice but was replaced with the scorers of the goals which secured the 1971 FA Cup and League double for Arsenal – Eddie Kelly and Charlie George. They formed a unique double act regaling the audience with a mixture of their own stories and candid answers to questions raised from the floor. It was a very special night as 2 good friends of the club were flown over from Italy as guests of The Dover Gooners. Roberto Gionchelli and Teo Scarpellini first met the Dover Gooners on a pre season tour of Austria in 2001. In June of this year a number of Dover Gooners along with wives and girlfriends travelled to Bergamo for the 10th Anniversary party of their club. As a sign of their friendship we were presented with a special hand stitched banner cementing the relationship between the 2 clubs. This took pride of place on the stage on Saturday and the chairman Tim Padfield invited the 2 Italians to the stage to make our own presentation to them of crystal tankards engraved with the crests of both clubs. 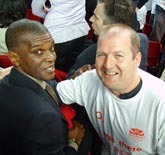 The Dover Gooners were, once again, supporting The Willow Foundation (www.willowfoundation.org.uk), the charity for young people with serious illness, set up and run by another Arsenal great, and TV personality, Bob Wilson. Once again the raffle was a collectors dream, with some rare, exclusive and unique memorabilia available. The generosity of those present saw a cheque presented at the end of the night for £2,000, and this was accepted by Eddie and Charlie, on behalf of Willow. A further cheque was presented by The Gunners Bergamo as they also raised £500 for Willow at their party in June. The site is always changing and updateing. 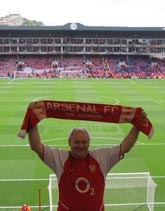 The blog link has changed to myarsenalopinion.blogspot.com and our Gallery has a whole new look. ~Why not check them out! If anybody wishes to advertise on our site please contact us. New Photos have been uploaded. Our Photo Gallery is rapidly expanding. 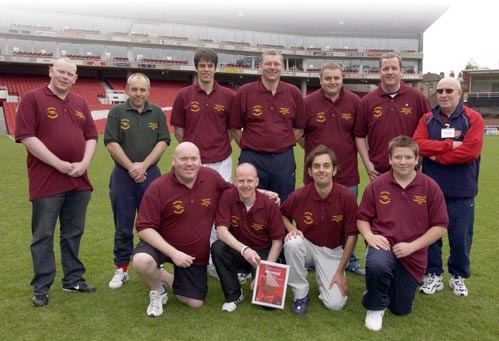 If you have photos from over the years as a Dover Gooners Arsenal Fans please send to Mick Padfield or Leanne (at leanne_gooners@hotmail.co.uk ) to be added to our Gallery pages. Even low quality photos can be fixed. Dover Gooners is proudly housting a Legends Dinner at the Dover Club in with guest Speaker Kenny Samson. Tickets sold thick and fast to members of the Dover Gooners club and there families. Tickets are now sold out. You've found it!!! So you know it has been re launched - Thanks Leanne! 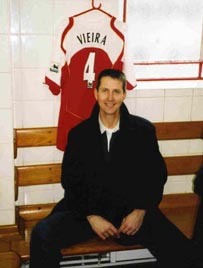 Dover Gooners is proudly housting a Legends Dinner at the Dover Club in with guest Speaker Nigal Winterburn. Tickets sold thick and fast to members of the Dover Gooners club and there families. Tickets are now sold out.